People sometimes ask me, "what's your favorite strip?" That's an awfully tough one to answer, because I like a great many strips for a great many different reasons. I usually answer Bringing Up Father, since the combined level of humor and art is so fabulous. But if the question were rephrased, something like "if you were stranded on a desert island and one strip washed up on the beach once a week, what strip would you pick?" I might just have to go with Adventures of Lovely Lilly. Not many episodes of this obscure classic were produced, but if I could get a new installment of this strip once a week I'd be one contented castaway. 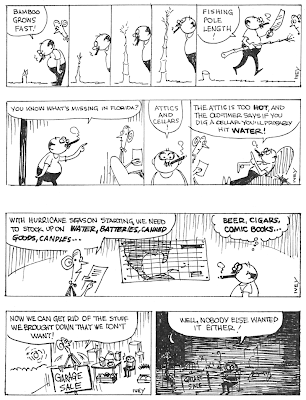 Some of you were introduced to this bizarre strip many moons ago in Rick Marschall's Nemo magazine (issue 27 to be precise) as I was. Just six strips were reproduced in that magazine, in black and white, but boy did they make an impression on me. Each strip is a pithy four panel tale told in classic storybook fashion. It stars the most darling little flower of a girl, evidently not much past toddler age. She wears clothes that would be the envy of any expensive porcelain doll. 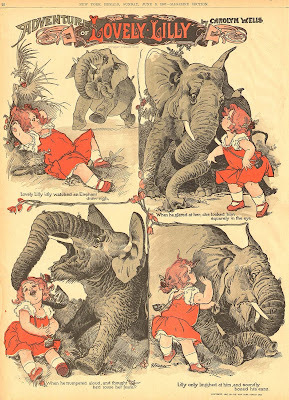 In each strip our poor little darling Lilly is menaced by a ferocious jungle beast. Oh no! What will our little heroine do? Is Lilly rescued by some heroic feller? Does she reason with the jungle beast, or pull a thorn from its foot? Mmmm, not quite. What our little waif does is put some serious beat down on that animal. I'm talking treatment that would make a slaughterhouse worker woozy. I'm talking the kind of cruelty that would put a PETA member in therapy for years. And she does it all while wearing that beatific little china doll smile, the sort of expression that makes mommas use up a roll of film in the ol' Instamatic. But if the deliciously bizarre plot of the strip isn't enough to place it in the hall of fame, the artwork provides the final vault up into the highest ranks. Is it too hyperbolic of me to say that this is some of the most beautiful line art ever to appear in a newspaper? Take my word for it that you do not get the full effect either here or in the old Nemo magazine. These incredible full page strips are absolute heaven to behold in their giant original glory. But enough of my fawning. We've got stats to cover. Adventures of Lovely Lilly ran in the magazine section of the Sunday New York Herald. The feature started in December 1906 (this date is per Marschall, I haven't seen any from before January 1907). It ran until January 27, then returned for a second engagement from May 19 to June 9 1907. The strip was written by Carolyn Wells, a popular humorist who did the writing duties on a large number of Sunday magazine cover comics (though none at all like this). The art was by a fellow named G. F. (George Frederick) Kaber in apparently his only experience slumming in newspaper comics. Lambiek.net also has some gorgeous B&W panels from this strip on its site. Do you know if those are just bleached-out versions of the colour Sunday pages, or if that ran in a different format? Hello, Allan---The HERALD also produced a series of post cards promoting this series.---Cole Johnson. The ones on lambiek are reproduced from the black and white Nemo magazine article. All the originals were in 2-3 colors. Cole -- no, didn't know about the postcards. How weird to do postcards for such a limited run series! We moved house into a little village in Co Durham UK over 25yr ago and found undoor floorboards a copy of the new york herald including a lovley lilly illustration. Unfortunately it had deteriorated a little so I had it stuck onto a back board and framed as I loved it so much. It is dated Sunday 19th May 1907. Lovely Lilly with Wolf in colour. One of the hitherto unreported casualties in the Korean War was an editorial cartoon by AP Newsfeatures' John "Milt" Morris. It showed two sketches of a South Korean soldier: one titled "The Yaks Are Coming"; the other titled "The Ya(n)ks Are Coming." The title: "Typographical Correction." Mr. Morris was prideful about the cartoon (and still is) except for one thing: the Yak planes evaporated so fast the cartoon lost its punch between the' time it was penned and the date it hit papers. But the added problems of a shooting war in an already tough field rest lightly on the 43-year-old cartoonist. His brown hair is un-flecked with gray ("I'll take gray, just so long as I get hair," he says). He has an unsophisticated air of geniality. And he draws both six-a-week editorial cartoons and a daily panel and Sunday page, "Neighborly Neighbors" for APN. His recipe for not getting stomach ulcers: "I don't take myself too seriously." About 200 papers use his cartoons. "Cartoonist by accident" is not cliche but literal fact as far as Mr. Morris is concerned. A native Californian, he was on the receiving end of a heavy truck at age 13 in San Bernardino. Abed for a year recuperating, he finally got bored with reading and took up drawing, by correspondence course. After high school, he landed a job with the Los Angeles Herald-Express—in the morgue. But in two years he had dug his way out into the art department. He attended art classes at night. Coming to New York at 23 and during the depression, he jobhunted without luck; finally landed on the New York Journal American after five months when he was down to $45—$4 less than bus fare home. 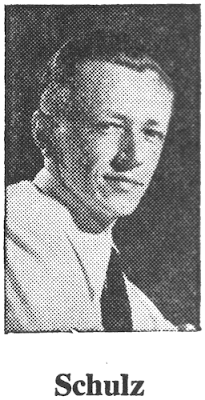 In 1935 he joined APN. He soon took over "Neighborly Neighbors", which Oscar Hitt had started. And beginning in 1940, he used to substitute for Editorial Cartoonist Henry "Hank" Barrow when the latter was sick or on vacation. One memorable pinch-hit cartoon was at the time of Henry Ford's death. It showed a desert with two tire tracks going across it. Being a fast worker had given Mr. Morris some priming for the new job. He had found when engaged only on "Neighborly Neighbors" that he was sometimes enough ahead (the panel has continuity) to do extra jobs. In 1943 he trekked to Washington to draw Roosevelt, in his office, and other Washington bigwigs. In 1945, he went to Washington to sketch Truman and cabinet. Six-shot series were offered each time. 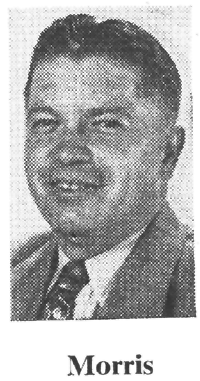 Harold Ickes, he said, was his biggest surprise. While that official had a reputation for blasting people, his office was the "most quiet, library-like office I had ever been in. Ickes never said a word. Just occasionally looked over his glasses at me. It was most startling. Everybody else talked." Mr. Morris likes the variety of dividing his time between a human interest panel and editorial cartoons. And there are likenesses between the two: his Common People of the editorial cartoons is a caricature of his father ("He gets a kick out of it when I don't make him too milktoasty looking"); and Andy Jarnsen of the panel is a caricature of brother-in-law Andy Johnson, who is "nuts about fishing." Mr. Morris sums up: "An editorial cartoon is mainly pointing up human frailties on a big scale. The other is pointing up the human frailties of 'the little citizens.' "
You know, Allan, I was just thinking yesterday about how the old cartoonists were often portrayed in publicity pieces as kindly old uncles or gee whiz golly gosh boys next door who just liked sketchin' funny pictures fer the kids. This article flows right through that same lens. I imagine it helped make cartoonists in general seem less threatening, or at least set them apart from the shamelessly alcoholic, womanizing breed we often meet in the first generation of comic-strip artists. Only the second continuing Sunday series from the Philadelphia Press, The Quaker Kids is a great example of what our newspapers lost out on when syndicated comics became the norm. Just try and get something with this sort of local flavor from a syndicate! The Quaker Kids was produced from July 2 to October 22 1899 by a fellow named Joseph S. Moyer, the only continuing series he did to my knowledge. Obviously Joe took considerable inspiration from the work of the good Mr. Outcault. This image (or rather the jigsaw puzzle version of it) supplied by the fabulous Keystone Scan-o-Matic, Cole Johnson. A second example was proffered, but sadly it suffered considerably on its trip through the ether and had to be put out of its misery. release, is a li'l strip. It's just 1.5 inches deep, and the width is three or four columns, instead of the conventional four or five. The space bogey had a lot to do with the size, naturally. Syndicate folk point out four columns can be arranged two on two for a panel effect. Artist is 27-year-old Charles M. Schulz who learned his trade well from an art instruction correspondence course and a few night sketching classes at the School of Art in his native Minneapolis. He's now an instructor at Art Instruction, Inc., and has made a number of sells to the Saturday Evening Post. He sold "Li'l Folks" (plural then) to the St. Paul Pioneer Press as a weekly feature for two years. United Feature Syndicate's new gag - a - day about kids by Charles M. Schulz has had a name change from "Li'l Folk" to "Peanuts" due to radio and strip conflicts. Here's yet another example of the good art/bad writing combination that was a hallmark of the Boston Herald's syndicated Sunday sections. 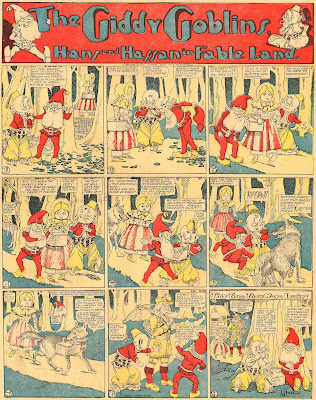 Here we have The Giddy Goblins - Hans and Hassan in Fableland, a strip about a pair of elfen mischief makers, one a German and the other -- well, I'm not sure. A turk? An arab? Anyway, the strip injects these two fellows into well-known children's stories with not very hilarious results. The emphasis seems to be on how much dialogue can be squeezed onto a page rather than what humor might be wrung from the story. A.T. "Crite" Crichton, who had a distinctive unvarnished style, was the perpetrator of this series, which ran from January 18 to August 30 1908. 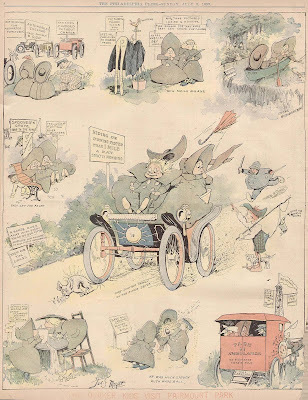 Crite was a freelancer who also had a few strips appear in the New York World, the New York Herald and the World Color Printing section in a cartooning career that I can track from 1904-1911. What he did before and after that I dunno. 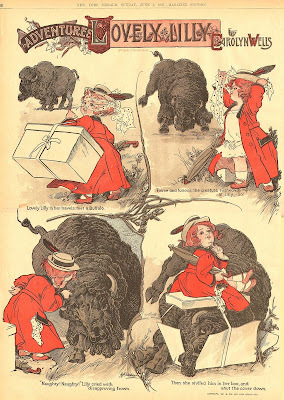 Cretin, I mean, Crichton also did a thing for the Philadelphia North American Company called "Little Growling Bird in Windego Land" about a precious little blonde girl who is shown the precious ways of the red man by a precious little indian brave and his precious little animal pals. The verbose captions gave everything multi-syllabic, phoney-baloney tribal names as they explained the little to nothing that happened over the full page stories. Dig some up and you'll enjoy them as much as I have.